A great deal has changed in music since Mr. Robert Stumpf II reviewed this disc in 1999. The CD industry has shifted to downloads, historical recordings have flooded the market, and there are more ways that ever to get your hands on great performances past and present. Cala has been somewhat inactive recently (thanks to Albany Music for allowing me to review all these wonderful titles so late in the game) and I didn't know when I asked for a batch of discs from their Stokowski holdings that our archives already held so many. So consider this a comparative review with today's market in mind. 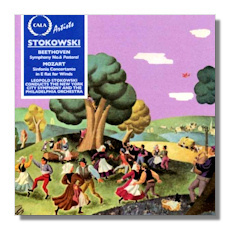 Recordings of Stokowski have seen a renewed interest in the last few years from EMI and Sony, with Decca – I would assume – possibly preparing to gather their reissues into one of those budget mega-sets they do so well. In addition, Guild has proven to be a goldmine for fans of the conductor, digging up rare recordings that – like those on Cala – were previously difficult to find. In 2014, Mr. Stumpf and I both reviewed Guild 2405 with enthusiasm; an all-Mozart program from Stokowski was quite the find. We generally admired the same items, and this present disc shows the conductor in full command of the Philadelphia strings for the Sinfonia Concertante. His star wind soloists are nothing short of delightful, and don't seem to mind the Romantic framework one bit. You won't either. The "Pastoral" is remarkably similar to the conductor's NBC Symphony account on Cala 545. The first movement lacks a repeat; this is the one Beethoven symphony where that doesn't really bother me. The final three movements are radiant as you might expect, though the orchestra lacks even the questionable allure of Toscanini's NBC musicians. The 1945 sound is also not ideal. None of the above is the deal breaker, because another 16 minute andante sits uncomfortably in the middle of the work. As I said in my review of Cala 545, the approach has grown on me, and in fact I find this earlier account a hair more flowing. But let's not kid ourselves, this borders on the obscene in both cases. I never thought I would hear a version that made Stoki's heavily cut and artificially engineered Fantasia take feel normal, but I have now heard two. I've spent most of an afternoon with these two discs, and I am puzzled but not wholly unconvinced. If I called Cala 545 "bizarre", this is less so, and possibly the more important disc despite the dated production values.